This very late Hinners Pipe Organ is perhaps one of the largest late instruments ever produced. Originally built as Bethany Reformed Church, founded in 1890, Christ Temple Cathdral, itself founded in 1917, acquired the building in 1972. The organ had become unplayable because the static reservoir needed a complete restoration and releathering. This work was accomplished in 2010. This full-throated instrument sits in a large room and is still used regularly by the congregation. 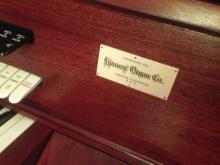 This organ was featured at the 2012 Organ Historical Society convention in Chicago. We are honored to maintain this instrument!